Pneumatics & Sensors Ireland based in Piltown in Co Kilkenny, is one of the country’s leading component sourcing and supply partners for all factory automation processes. A combination of expertise in both sectors, partnerships with leading international manufacturers, and unrivalled customer service, has seen the firm become the partner of choice for many leading Irish industries. 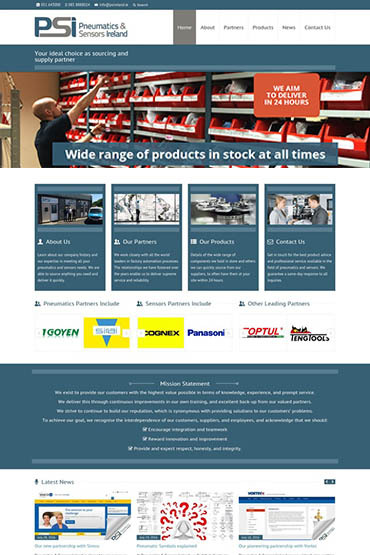 They approached us to build a corporate brochure website, to showcase their expertise and range to potential new clients, and also to portray their existing standing and reputation to potential new international suppliers. We saw this as a great opportunity for both us and them, and eagerly got to work. We first engaged with company founder and Managing Director, Michael Murphy, to establish exactly his vision for the website, what he would like to rank for, and the extent of the content needed to achieve this. We then researched the online space for this sector, to identify realistic expectations for traffic, leads, and conversions. Following further consultation with Pneumatics & Sensors Ireland, we drew up and agreed a project charter, and began the build in earnest. Our senior copywriter next met the client, to get the story of the company history and operations, and the source material for what would be quite technical and specialised content in places. He efficiently produced keyword-optimised and SEO-friendly content, which included the client’s marketing messages and which won their approval immediately. Our senior developer then got stuck in. He crafted a powerful home page which has the desired corporate ‘feel’ while still remaining attractive to the eye and portraying all the key messages to the brain. Images in sliders and sales funnels were a mix of company staff, typical industrial settings, and components supplied by Pneumatics & Sensors Ireland. The logos of 60 world-leading supply partners are accommodated in three rotating sliders, broken down by category, to help show the standing that the company has in its field. All internal pages were equally attractively designed, with a strategic mix of text and graphic content, and clear calls to action. Extensive on-page and off-page SEO work was carried out at each stage of the build, while careful attention was also paid to all necessary tags, meta descriptions, etc. As with all our builds, the finished site is fully responsive for viewing on mobile devices. Our client was delighted with how things turned out – and you can see, by having a look yourself here.